Abstract Trusted benchmarks should provide reproducible results obtained following a transparent and well-defined process. In this paper, we show how Containers, originally developed to ease the automated deployment of Cloud application components, can be used in the context of a benchmarking methodology. The proposed methodology focuses on Workflow Management Systems (WfMSs), a critical service orchestration middleware, which can be characterized by its architectural complexity, for which Docker Containers offer a highly suitable approach. 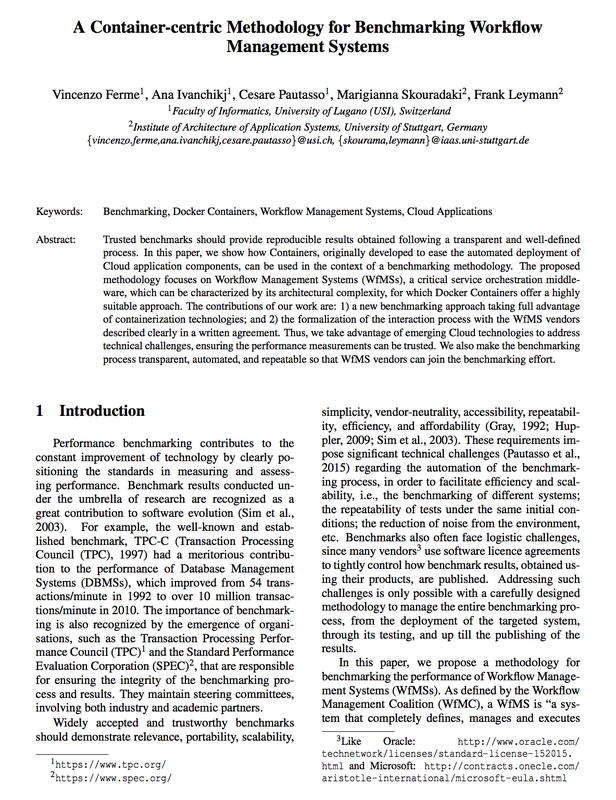 The contributions of our work are: 1) a new benchmarking approach taking full advantage of containerization technologies; and 2) the formalization of the interaction process with the WfMS vendors described clearly in a written agreement. Thus, we take advantage of emerging Cloud technologies to address technical challenges, ensuring the performance measurements can be trusted. We also make the benchmarking process transparent, automated, and repeatable so that WfMS vendors can join the benchmarking effort.